Roll out 1 pastry block on lightly floured surface into 12-inch square; cut into 12 squares. Place in single layer on lightly floured baking sheet. Repeat with remaining pastry block. Spoon 1-1/2 tsp. cream cheese product onto centre of each pastry square. 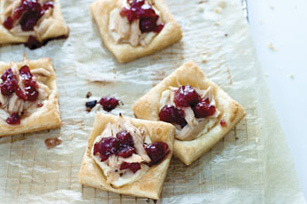 Top with chicken and cranberry sauce. Bake 14 to 15 min. or until pasty is golden brown, rotating baking sheets after 7 min. Use a pizza cutter to easily cut the pastry dough into squares.